Target Liberty: How Would Disputes Be Resolved in a Private Property Society? How Would Disputes Be Resolved in a Private Property Society? RW asks me: "Why would you want to interfere with this [PPS] with a rule machine of some sort overruling private property freedom that would eventually result in a lot of rules you don't like?" But PPS is a rule machine which, unmodified, has results I do not like. RW makes the error of thinking that the punishment of private property violators is a PART of the private property rule. It is not. It is a separate rule - one which he is not crafting well. We can have a PPS which absolutely observes the rule of private property and yet leaves violation punishment to a separate rule. Remember what the PPS is: a rule that says we may not interfere with your use of your property. It isn't a rule for you to obey, but for the rest of us to obey. So your PPS lays down a rule for the rest of us to obey, and we, in turn, lay down a rule for you to obey: punishment will be according to some code, not your arbitrary whim. We do not get to arbitrarily decide what is your property and you do not get to arbitrarily decide what is our punishment. 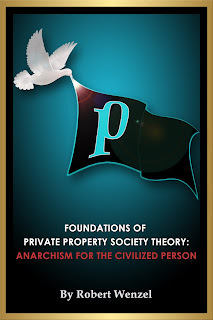 A proper Private Property Society is a bargain struck to mutual advantage - not a one-sided power granted by us to you. You may not agree with the punishment our code prescribes, but then we may not agree that the property is yours. RW seems to want us to agree to his declaration that some property is his and also to his declaration of its value to him (unprovable since value is subjective and the subjective is without evidence). Such flagrantly one-sided arbitrariness is absurd in human relations. We can not build a society by pretending that subjective whims are facts to be balanced in the scales of justice. My point in discussing proportional punishment theory is to simply refute it as a logically sound theory that seemingly suggests a necessary addendum to the private property owner setting rules. Fundamentally it goes back to the insight of the Austrian school economists that all value is subjective. Thus, an outsider could never determine what is "proportional punishment." That said, PPS does not call for the rejection of an attempt to impose a proportional punishment theory, of for that matter, punishment determined by a role of the dice or the ouija board. The only rule in a PPS is the owner sets the rules on his property. It is very likely that most people will set sane rules, including punishment rules on their property--or they won't have many visitors. PPS "does not lay down a rule..that punishment will be according to some code..." anymore than PPS demands that all must hold that 2 plus 2 equals four. You can go along all day and night holding to the idea that 2 plus 2 equals six or that proportionality of punishment can somehow magically be determined. Robert, I don't find your skepticism of the idea of proportionality to be persuasive. For instance, if someone destroys an object of great value to me, then a proportional punishment would be that I have the right to destroy an object of great value to them. But value is subjective. How can outsiders determine value? I may sleep with an old teddy bear that you put little value on but would cause me heart palpitations if it were maliciously destroyed. You are going to sit there and tell me just how much the loss of the teddy bear is to me and not a penny more? If someone causes paralysis of my right leg, proportional punishment would be that I have the right to paralyze one of their legs (or have someone do this for me). How is that "proportional" punishment if the leg damaged belongs to LeBron James and it ends his career and future earning in the hundred of millions? What if I like to walk and never will do so again but the perpetrator is a couch potato who doesn't care one hoot about a paralyzed leg? What if the perpetrator is already in a wheelchair because of his left leg and has no uise for an active right leg at all? There is no such thing as proportional punishment. All value is subjective. The value of the same physical object can be completely different for different people. Value is always in the eye of the beholder. Robert, in your version of a PPS how would disputes over property rights be resolved? If I decide to buy property, I want to make sure that the people around me have the same respect for private property, that is all. Notice: I am not attempting to drag in some court that has set rules over a region. I am just looking for an area where people, in general, respect each other and mind their own business. Recognizing that even under the conditions where property is generally respected that outsiders could still wander in and do damage or disputes could arise with neighbors, in such an area, I would hire a private security agency to protect my property. If this is a big agency, they would have other clients and say to me,"Look, we will back you up on what is your property, but if you have a dispute with one of our other clients, we want you to agree that we can take this to our private court, where we have the most wise and fair judges in the world." Now at this point. I can say "No thanks" or because I am reasonable and have checked out to see that the security agency's judges are indeed the wisest and most fair in the land, I sign up. Notice here: No one is forcing me to use this court and follow their rules, I am agreeing to do so. I don't have to. I can live without the agency and court if I want. Or I can hire another agency and a different court. What if my agency comes up against my opposition who has a different agency? I would imagine such agencies would come up against each other many, many times in a PPS, so that, if they are profit seekers, they would just reach an agreement that if they come up against each other they would use certain great. wise and fair judges that they have both decided on. Of course, in my contract with my agency, they would stipulate that when coming up against other agencies, they would have the option to determine how a dispute is resolved in which court, by an agreement between the two agencies. All agencies would compete to be the wisest and fairest in the land since that is how they would get clients---and compete that their rules are the best. An agency that was crooked wouldn't last long. Notice again, no over-ruling laws, Choose your security agency by the way it operates with its own clients and rules, and how they operate with other agencies that might have different rules. If Dr. Block wants to claim that the shoes I am wearing are his, he is free to do so, but he would never win with any serious agency that was competing for customers on the basis of being fair about private property. I would prove (perhaps by receipt) that I acquired the shoes via a legitimate transaction. There would be no agency that would take the case of Dr. Block here since they know they would lose if it went to court. And if he is so rich that he is able to get an agency to represent him anyway, he would lose before the fair and wise judges. Yet RW still completely misses the point. Subjective Value is a slippery basis for determining punishment. Since, on this topic, it's like arguing with a wall, I'll make this as brief as possible. But, since RW has expended so much time and effort arguing on this topic, he's wedded to it, and is unlikely to ever change his position. And it seems as though Wenzel needs to spend more time on the topic because it obviously hasn't completely penetrated your skull. And you missed the point as well (sloppy hypothetical notwithstanding). So here it is again. Subjective harm is a purely mental phenomenon. It can occur both when a crime has objectively taken place and when it hasn't. It is entirely in the mind of the "victim". And that "victim" is no less psychically harmed when no objective crime has taken place. Further, you can a) objectively determine whether a crime has been committed and then attempt (as much as possible) to objectively determine an appropriate [read: proportionate] punishment, or you can b) agree whenever someone subjectively claims they have been harmed and then use the subjective harm they claim to have suffered as the basis of punishment. It is logically inconsistent to mix and match. RW uses subjective harm as the determination of punishment BECAUSE the psychic harm cannot be measured. Yet, the fact that it cannot be measured is precisely WHY it cannot be used (and why no one else uses it). There would be no incentive not to claim maximum harm (in $ terms) for minor crimes, since the same could be done to you. Bottom line: subjective harm is leftist garbage that somehow has made it into RW's version of a PPS. So yeah, if your goal is for people to immediately demand the re-creation of a government, then RW's version of the PPS is probably the way to go. Because who wants to live under the 24/7 threat of becoming enslaved for life (or worse) simply for accidentally committing a crime? Robert, in quoting me above you overlooked my April 20 comment in response to the column "The Private Property Society and the Outliers," where I was more expansive. "In a PPS each community would develop norms about what are legitimate punishments for NAP violations. One such norm could be proportionality of punishment. If A violates B's property rights in a minor way, and B kills A (such as with Crazy Harry), then in that community such a sanction could be regarded as illegitimate for its lack of proportionality, and thus B would himself be regarded as violating the NAP. Accordingly, B may be, at a minimum, ostracized/excluded from further participation in that community, or liable to punishment himself in the form of retribution and/or compensatory damages." There I referenced proportional retribution, ostracization and compensatory damages as the menu from which norms may be chosen by communities. Thus LeBron could still sue for hundreds of millions of dollars in compensatory damages(more likely, make such a claim on his business insurance policy). And the "communities" to which I referred could be contractual, rather than physical. In other words, there could be a community of insurers which agrees on compensation scales and retribution not subject to further action. Most people will be in contractual privity with most everyone else under AnCap. Their insurance and legal defense providers wouldn't have it any other way. 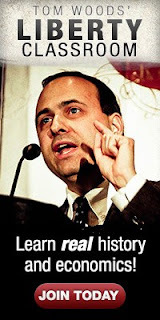 For everyone else, there would/could/should be Walter Block-ian "libertarian law" between strangers. The purpose of private property is to protect human beings from theft and violence. If some innocents accidently parachute onto land owned by cannibals, I cannot justify allowing those people to be eaten. Further, this "you can do whatever you want on your own property to other people" paradigm seems to allow for the most ghastly tortures, punishments and violations for people who inadvertently trespass in low population primitive societies. You suffer from "pathological altruism. (http://www.epjresearchroom.com//2014/05/pathological-altruism.html)"
To protect your bizarre crazy hypotheticals, you want to introduce overriding rules (i.e. government), a system that has killed hundreds of millions. I think RW would argue you are "Making an error of the specific over the general rule." You are creating a crazy hypothetical of a parachutist landing on the property of cannibals. And to solve this crazy specific you want to bring in some kind of general law to rule over all property, that is government that has killed and tortured hundreds of millions. I fail to see a problem with expecting a simple eviction of accidental intruders. I see a big problem if accidental intruders can ever be tortured, eaten, killed or really anything other than being evicted. Gently. On a practical level, how do you plan to obtain a general consensus to support standing by and allowing the enslavement, torture and/or murder of accidental intruders? Ever? And while considering that it is unlikely to ever obtain a general consensus to allow a voluntary 50 cent per day wage or employment contracts that allow for forceful sexual harassment? Also, who is going to punish a private rescue squad who successfully saves a group of accidental intruders from a life of a private property Auschwitz? In PPS the property owner does not need to defend his alleged NAP violations that take place on his property. Self ownership extends to Private Property. However Private Property does not extend to NAP violation. If the Law is discovered - ie NAP violations - there is no problem with Law that supersedes Private Property. In other words, people are responsible for not violating NAP anywhere. Private Property is even better protected in a libertarian Constitutional government. The Constitution is one sentence long: No government body shall enact laws or other rules which violate NAP. And what is the protection against the government which itself violates the NAP? And how does this government finance itself without violating the NAP? All of these questions about harm, punishment and compensation exist today, with the state, and would exist without a state. They are simply a function of humanity (imperfection, lack of omniscience, etc.). The difference between a PPS and a society with a state is that solutions are determined from the ground up, over time, on a customized basis by those directly impacted, rather than a one-size-fits-all-solution being imposed from the top down by remote actors. Competition in the provision of law and security services, as opposed to provision by a monopoly, will yield the same benefits as competition vs. monopoly in the provision of every other economic good: more innovation, responsiveness to customer demand, better service and lower prices. And unlike today, providers of these services would themselves be held to the same standards as everyone else, and not have any special immunity. It's important to keep these differences in mind, instead of trying to predict exactly what a PPS would look like.